Hello again, thank you for stopping by my blog to take a look. I really enjoyed making this card and was pleased with the finished look. To make my card I used a blank a6 size card, I cut a matt of gold card stock slightly smaller than the white base card, I just cut it enough to leave a small border. I embossed the gold card using a flower embossing folder. 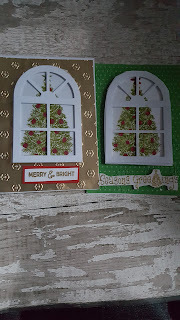 I cut the window from the die using white card, I then cut a piece of acetate and covered the back of the die cut window piece, I used wet glue to stick the acetate. 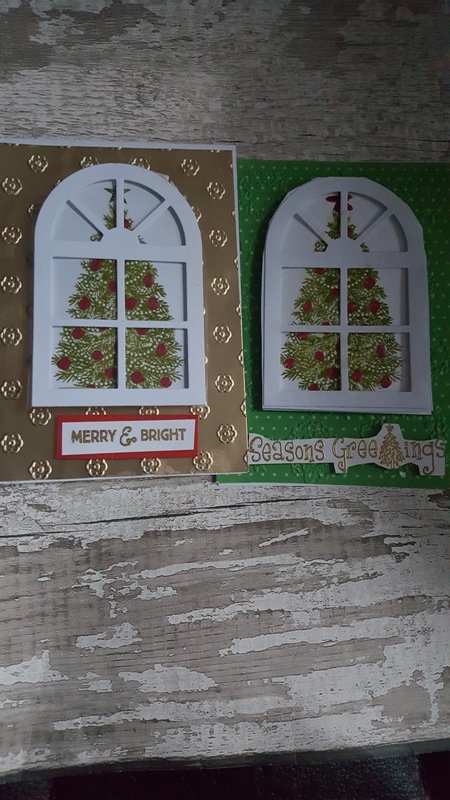 I stamped the christmas tree image using peeled paint distress ink from Tim Holtz, I coloured the baubles on the christmas tree image using my spectrum noir pens, I cut around the tree image so it would fit behind the acetate, I then stuck the tree image to the window. I used foam tape to stick the window to my base card. I stamped my sentiment using versamark ink and then heat embossed this using wow gold embossing powder. I cut around the sentiment and stuck it to a piece of red card and the used foam pads to stick it on to my card.